Kick-off this month is my sole ABC purchase at Beaulieu this year, a photo depicting the start of a motorcycle race at Brooklands. It was annotated 'Duke of York's Senior Handicap' on the back, not a huge amount to go on, but between them, Roger Bird of the Brooklands Museum and Registrar David, have supplied enough details to make quite a complete story! David, who evidently has eagle eyes, was able to identify No. 19 as Geoff Maund, on KN 9850! For my part, it appears that the rear suspension has been scrapped, and replaced by a pair of diagonal struts, not I think a good idea on Brooklands' notorious bumps. Rearset footrests are featured: the one on the LHS is just ahead of Maund's foot.There is a front-wheel driven speedo, and some mods to the inlet manifold, I think: isn't that a carburettor bellmouth just in front of Maund's left knee? 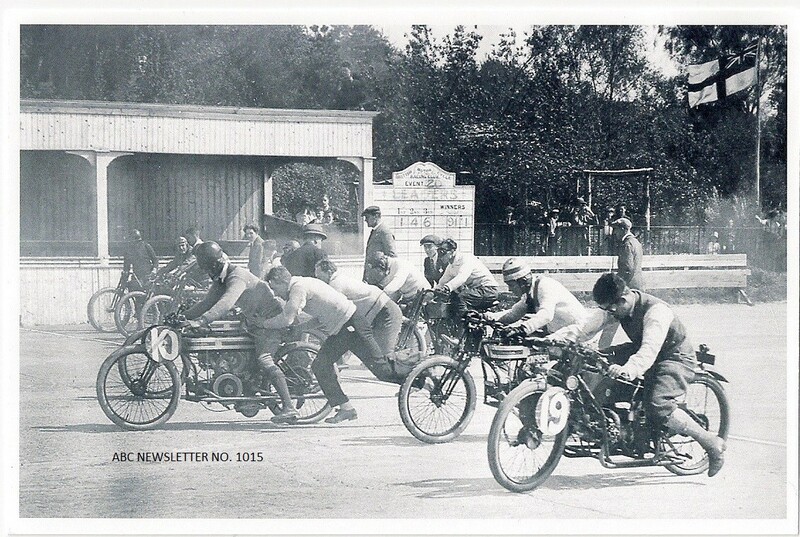 Roger confirms that this was the 5th race on 20th May 1922, the Duke of York's 3-Lap Senior Motor Cycle Handicap. Either Maund was confident of victory, or had a starting problem, because he was flagged off 33 seconds before V.Gayford, No. 10, on the Douglas. (Scratch man was no less than the famous Claude Temple, on a large Harley, visible in the background. Winner was J. Hall on a Trump-JAP). Verily is it said that a good picture can tell a story of a thousand words! Its quality is such that it can be zoomed to reveal a surprising amount of extra detail. 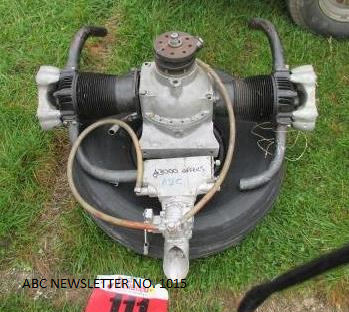 If Sopwiths were thin on the ground at Beaulieu, Veterama on the outskirts of Mannheim was totally barren! Curiously, there were two Skootamotas there, both in quite smart condition, priced at about eight thousand euros each. One was MD 794, but is not in the Hales Register. 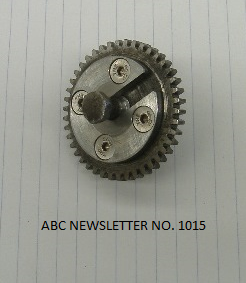 After recent refurbishment of his magneto, Andrew decided to treat its pinion to a self-releasing bolt system, similar in principal to the one on the gearbox's sprocket-nut. His elegantly-simple solution is depicted below. He claims that the taper can easily be 'broken', working through the aperture in the timing chest cover, normally closed by the large brass boss. This is Andrew's Assembly picture, which I think is eloquent enough as is, although there is a Detail photo that I can forward to anyone requesting it.